It's time to choose your preferred ambiance among our 44 rooms spread over 6 floors. 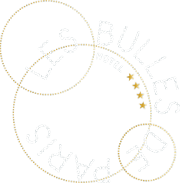 The Hotel Les Bulles de Paris is fully dedicated to Champagne and, naturally, the theme of this prestigious beverage is expressed in clever and delightful ways. On each floor you will find a different variation on this theme and various amenities designed to fulfil your needs and desires. There’s Paris and Champagne, with its dark blue and grey colour scheme; Arts and Champagne, where green is honoured; Love and Champagne, with its red rose hues; Partying and Champagne, where black and gold reign supreme and, finally, the gold and silver adorned Women and Champagne. These are the ways in which our theme is expressed in our comfortable guest rooms in the heart of the Latin Quarter of Paris. We invite you to spend exceptional nights in one of our hotel’s prestigious suites. Always with a view to respect our central theme, namely Champagne, the Hotel Les Bulles de Paris offers suites whose names are derived from some of the most prominent houses of Champagne. As each of these suites for 2 people offer a double bed or two single beds and a sofa bed available for a third with an extra fee, along with a bathroom with shower, the major difference lies in the Champagne offered. So it is that when you book a suite in the hotel, a bottle of Champagne produced by the house from which the name of the suite is taken will be waiting for you. Don't hesitate any longer in making your reservation to spend one or more nights in our beautifully decorated modern suites, in which art and colour are mingled with exquisite taste.